A water chiller typically operates with a set point of 50°F or higher. However, if setpoints between 20°F - 48°F are required, special precautions must be taken to prevent freezing and possible damage. Attentions must be given to freeze protection, water supply and pressure swith limit adjustments. 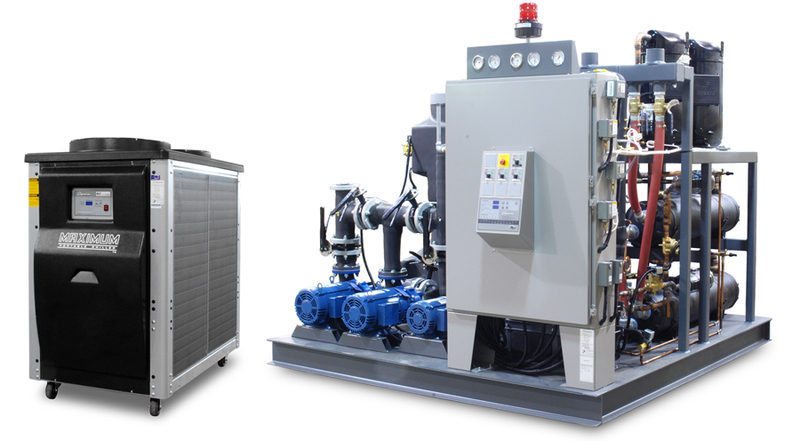 Shown : Maximum Series Portable Water Chiller, 10 ton air-cooled and Titan Series Central Water Chiller, 60 ton air-cooled. It is understood that untreated water freezes at 32°F. The refrigerant in the chiller's evaporator must be 10°F or more colder than the desired fluid set point to create heat transfer. Advantage recommends a fluid temperature lower limit of 48°F for straight water. Below 48° a water and inhibited prophylene glycol mixture is recommended to lower the fluid freeze point. Limiting the lower set point for straight water to 48°F allows for a small buffer between the operating evaporating temperature and the fluid freez point minimizing the risk of freezing the evaporator. Evaporator freezing can casue it to fail and result in extensive damage to the chiller. Therefore, an inhibited propylene glycol and water soltuion must be used in lieu of straight water for set points below 48°F. Prescribed amounts are listed in the chart on this page. While the inhibited glycol percentages listed may provide freeze protection well below the minimum protection level required the percentages listed are the minimum recommended by most fluid manufacturers for the included scale and corrosion inhibitors to work properly. On initial installation of the unit, the water/glycol solution should be premixed, then added to the reservoir. After the pump has been started, water lines filled and air purged, it may be necessary to add more water/glycol solution to maintain the recommended reservoir level. Note. A refractomeeter, such as Misco 7084VP+ should be used on a regular basis to determine the mixture strength according to freeze point. The freeze point temperature should be 25°F below the lowest required set point. Water will evaporate from the mixture and if you continue to add a premixed solution eventually you have too much glycol. It is necessary to add water or glycol to maintain proper freeze point temperature. Please Note : Automotive type antifreeze must not be used in your Advantage chiller. Automotive type antifreeze contain silicates that adhere to heat transfer surfaces of the system preventnig maximum heat transfer. Also, higher than required ratios of inhibited propylene glycol to water inhibits effective heat transfer. See the chart on this page and the chiller's operating manual for specific details. The automatic water supply (if equipped) restores the reservoir water level as needed. However, if untreated water is added to a water/glycol solution, dilution will occur decreasing the freeze protecting ability of the soltuion. Therefore, the water supply source must be disconnected and the connection capped. The operator must monitor the water/glycol level and manually make-up maintain proper reservoir level. To ensure safe and efficient operations at lower set points, adjustments of the freezestat (where equipped) and low pressure switch factory settings are required. The chart on this page lists the appropriate settings. The low pressure switch serves as the main defense against freezing and to protect the compressor from adverse suction pressures. Suction pressures derease with lower operating setpoints. To prevent freezing and short cycling the compressor, the low pressure switch must be adjusted to accomodate the lower setpoint. Units may be equipped and an adjustable low pressure switch (figure A) or a non adjustable "fixed" low pressure switch (figure B). For units with adjustable pressure switches (figure A) adjustments to the low pressure switch are moade by rotating the adjusting screw on top of the control and observing the movement of the pointers in the control window until the prescribed setting is determined. For units with non-adjustable "fixed" pressure switches, the low pressure switch (figure B) must be replaced with a switch with the appropriate lower range. A certificed refrigeration technican must make this change. Some units are equipped with a freezestat (figure C). For mechanical freezestats, adjustments are made by removing the cover and rotating the selector dial with a screwdriver. Electronic freezestats are adjusted through the setup parameters via the instrument control panel (consult the operating manual for details). At any set point, the possibilitly of freezing exists and it is the operator's responsibility to take necessary action to prevent freezing at all times. The Advantage warranty does not cover damages caused by freezing. Would you like to Download FYI #095 to your browser?